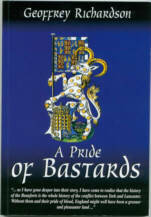 Author Geoffrey Richardson died peacefully in his sleep on Thursday May 8th 2003, following a fall. His family were with him. The funeral was held on Friday May 16th at Bradford's Scholemoor Crematorium, which was packed out in honour of a very popular man. Amongst the many floral tributes decorating the crematorium were bunches of white roses, 286 in total, one for every member of the Later Medieval Britain email discussion list, together with wreaths from the Worcestershire and the Yorkshire Branches of the Richard III Society. His family are very proud of the innumerable affectionate email tributes from all over the world to this remarkable man, whose second career as an author of books about Richard III and the families involved in the Wars of the Roses made him extremely popular amongst Ricardians. 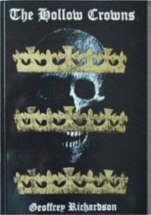 Many others have become interested in Richard III thanks to reading his fascinating books. The Worcestershire Branch of the Richard III Society had just made him an honorary member and Geoffrey was delighted. He was a dear personal friend and very generous to the branch, and will be sorely missed by many. Geoffrey started writing in 1995 after retiring early to care for his beloved wife Betty, to whom all his books are lovingly dedicated. He renewed his early interest in the military history of England, and fortunately for me and all his fans, decided to concentrate on the Wars of the Roses. 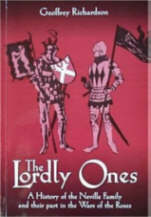 The Hollow Crowns, his first book published in 1996, was also the first to cover all the battles of the Wars of the Roses in one volume. Inspiration struck as he worked through all the battles, puzzling about who had killed the Princes in the Tower, and he presented his radical solution in an appendix. 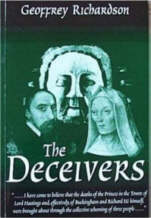 This generated a lot of interest and he developed his theories to produce The Deceivers, published in 1997, which lays the blame for the deaths of the Princes in the Tower and the defeat of Richard III at Bosworth, squarely at the door of three people. 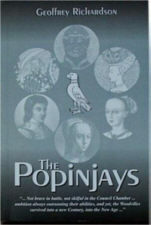 Each one broke new ground by being the first ever history of each family, and The Popinjays was also the first medieval history to be published in England in 2000. It's also the one in which I'm honoured to share the dedication with Judy Pimental and most importantly Betty Richardson. Geoffrey was a kind, generous friend who made me and my husband feel at ease immediately when we met for the first time at Middleham Castle in 1999. I first got to know him when I wrote to him with some minor corrections, and he promptly invited me to proof read any future books! I remember spending one birthday working through The Lordly Ones, as he was running out of time for getting it published, but I didn't mind at all. When we met at Middleham I picked up another precious package - The Popinjays. Geoffrey also joined us on the last day to give us his Towton Tour, including Saxton Church, the Lead Chapel, and the giant Yorkshire pudding at the Crooked Billet! That holiday is the best I've ever had. The following year Geoffrey came to Worcester in May to talk to the branch about Richard’s henchmen, spending the weekend with us. The talk went well and members were keen to talk to him afterwards and buy copies of his books. He loved that informal bit, chatting to people and sharing his vast store of knowledge about Richard. Geoffrey donated signed copies of all his books to our branch library, and also gave signed copies to send to two members who had suffered strokes. I cherish my own signed copies and frequently refer to them. When I asked for some copies to sell at Tewkesbury last year, he immediately said we could keep the profits for the branch, a very generous gesture indeed. His family are quite happy to continue this arrangement and have sent me additional copies to sell at the fairs at Mortimer's Cross and Tewkesbury. Even while very ill during the last few years he never let it stop him keeping in touch and being supportive, nor from promoting Richard at every possible opportunity. A very unique and special friend. 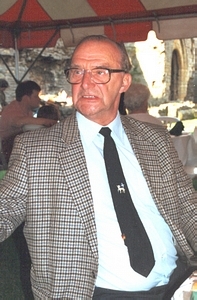 Geoffrey spent forty years promoting the exports of the British wool textile industry, for which the Queen presented him with the Order of the British Empire, before retiring early to care for his disabled wife Betty. His long experience of explaining obtuse government publications to plain-speaking mill owners in Yorkshire and Scotland stood him in good stead when it came to writing his books in clear attractive prose. His recipe for producing his books was to read all he could find, digest it, then tell it how he thought it happened, while remembering to put the story into history. He was born on November 8th 1929, the youngest of three boys. All were exceptionally bright, and went to Thornton Grammar School. The school is across the fields from Clayton in West Yorkshire where the family lived and part of the original Bronte house, where that talented family grew up, is in the school grounds. Being the youngest, Geoffrey found he had a hard job living up to his brothers’ reputations! There was a teacher there who taught English to all three brothers. It was from him that Geoffrey learned his love of Shakespeare, history and so much more. He really loved those school days. He had a photographic memory and if he had read anything or experienced it, he could tell you the story, including what everyone said and make you laugh so hard. Geoffrey presented the school with copies of his books and when he went there to present them he laughed to see pictures of Ken and Bill, his brothers, on the walls and guess what ...he was there too! So he must have done something right. Many thanks to Brenda, Geoffrey’s niece, for this last paragraph.